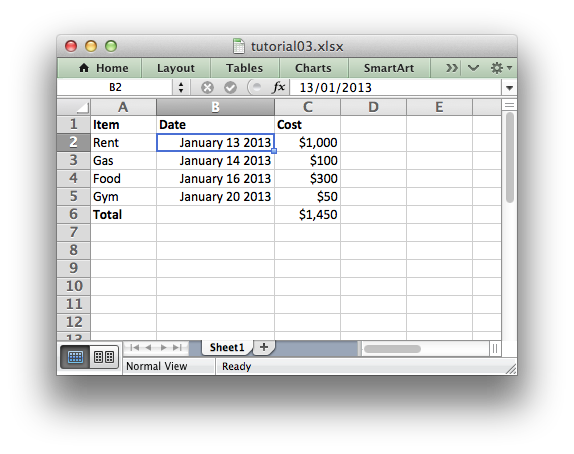 In the previous section we created a simple spreadsheet with formatting using Python and the XlsxWriter module. # Add an Excel date format. # Adjust the column width. # Convert the date string into a datetime object. The main difference between this and the previous program is that we have added a new Format object for dates and we have additional handling for data types. Excel treats different types of input data, such as strings and numbers, differently although it generally does it transparently to the user. XlsxWriter tries to emulate this in the worksheet.write() method by mapping Python data types to types that Excel supports. This is mainly to show that if you need more control over the type of data you write to a worksheet you can use the appropriate method. In this simplified example the write() method would actually have worked just as well. Date handling is explained in more detail in Working with Dates and Time. In the next sections we will look at the API in more detail starting with The Workbook Class.